Cables: 47 Laboratory OTA cable kit; Nirvana S-L & S-X interconnects, S-L speaker cables, Duo wiring harness, and Transmission Digital Interface; Cardas Neutral Reference digital cable, Auditorium 23 speaker cable; Tom Evans Audio Design interconnects. Murasaki Shikibu was a Lady of the Heian court culture in eleventh-century Japan. She wrote The Tale of Genji, which literary circles consider to be the world's first novel. Lady Shikibu's tome is about Genji, the son of the emperor. 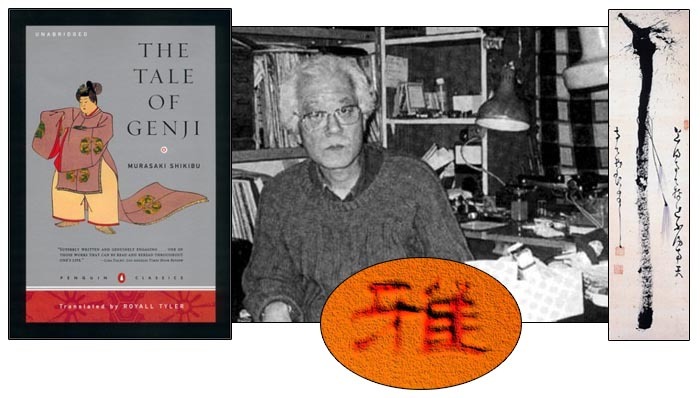 She describes his life growing up in the Heian court of the Japanese medieval period during which Japanese artists, writers, poets and intellectuals became concerned over a flood of ignorance and barbarism entering into and diluting their culture. In response, they cultivated and elevated their unique Japanese values and aesthetics that depicted the beauty, nobility and enlightenment at the true heart of their culture. Miyabi was one of the most important of those values. While there is no exact English translation, miyabi's meaning is connected with the appreciation of a moment of transitory and refined beauty as it passes in time. Its origin perhaps already reflected a sense of sadness and foreboding. The beauty that was the beating heart of Japanese culture was being swept away by the cold winds of barbarism and ignorance. One feared that its true and perfect cultural form would never be seen again. Miyabi. Genji's refined taste, good manners, personal deportment and his ability to appreciate both simple and complex beauty reflected his cultural refinement and perfection as a person. Miyabi. Genji was a living embodiment of the value of the pursuit of the essence of beauty and perfection that is alive within the Japanese culture. Miyabi. The flowers of Spring or the leaves of Fall are a perfect form of transitory beauty and color, as was the life of Genji in the Heian court. Miyabi. While I am not qualified to speak of miyabi, I hope that my attempt to do so suggests some small shadow of its essence for you. Let me defer to Takeda San, who is eminently qualified to speak of miyabi. He is the creator of the Miyabi phonograph cartridges after all. 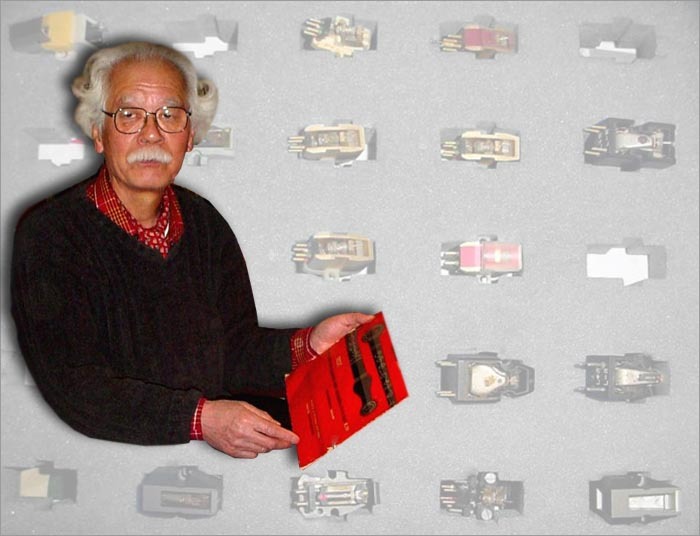 It is no coincidence that master phonograph cartridge designer Takeda San has chosen to name his creations Miyabi. It is the purpose of each Miyabi cartridge to provide a glimpse into the transitory beauty of music of the vinyl medium as it disappears in time - just as November's colorful maple leaves do around Mt. Mizugaki each year. Enjoy and cherish vinyl while you can. 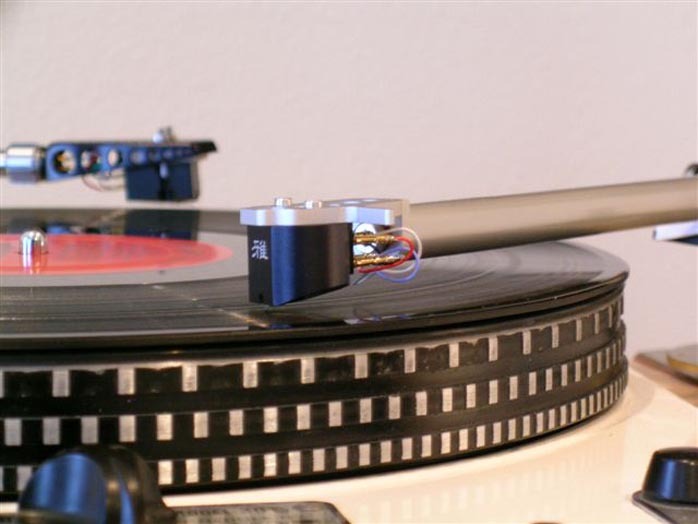 We may be in its November now, with digital winds whistling a cacophonous melody of vinyl's imminent demise. If Takeda San can help vinyl's beauty remain with us just a little longer with his Miyabi creations, then I am happy. Takeda San has loved music since his childhood in Japan and became familiar with the records and phonographs that bring vinyl to life at an early age. 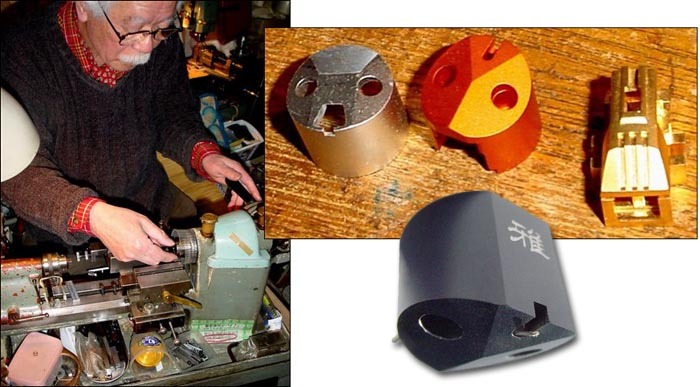 About 1960, Takeda San desired to enter into the HiFi manufacturing world and contemplated whether he would like to work on the input end (the cartridge) or the output end (the speakers). Takeda San decided he wanted to work on the input end because of his intimate familiarity with records. So he started working at major cartridge manufacturers in Japan. He became frustrated by the difference between the sound he desired and the actual sound the products made. Takeda San also spent a little too much of his working time listening to records and often got fired as a result (now that's a man with his priorities in order!). In the late 1960s, Takeda San became an independent designer who was developing OEM products for major companies while spending the rest of his available time experimenting with cartridges to improve their performance. Many of Takeda San's designs were produced under major brand names. Yet he wasn't satisfied by the sound they achieved when they were implemented as production versions of his designs. In the late 1970s, Takeda San started designing OEM products for many foreign companies, some of the most well-known among them being Krell, Cello and Mark Levinson. It was at this time that Takeda San also started producing cartridges under his own brand Miyabi. "There were many things that caused my frustration with reproduced music but the most essential of them was the lack of communication. The sound coming out of the speakers did not communicate with me as the sound of a live concert did. What was missing? I thought the major limiting factor was the lack of linearity in dynamics. This linearity rises smoothly from a low level pianissimo to the highest fortissimo. This dynamic linearity wasn't really linear in many past designs. Even a beautiful performance becomes unenjoyable and shrinks in scope with the dimished modulations in dynamics. For example, a piano fortissimo is reduced to a mezzo forte. While listening to Chopin's Etudes by Ashkenazy, I couldn't understand why the pianist played it like that. It didn't get exciting. Where it was supposed to boil with passion, it went soft. Very disappointing. Most of the cartridges in the past were like that. The problem was in the design itself. If you do it right, you can secure the linearity of dynamics. It took me only 30 years to realize how to do it properly. "Another thing that is very important is the composition of the material used at the signal input of cartridges. This material had been used in vintage pro cartridges from Western Electric, Decca, Neumann, EMI etc. (vintage mono cartridges lower left). In the early '60s, this material was replaced by another one which is easier to deal with. Since then, almost all cartridge manufacturers use the new material. That, I think, is the main reason why modern cartridges sounds smooth but rather hifi-ish. The most important midrange is not rich enough. I pretty much understood how to build this style of cartridge 15 years ago. I spent the 30 years before that experimenting. There are manufacturers who seem to recognize what's important. You'll know when you listen to their product. Assembling a cartridge is not a big deal. Everybody can do it after a year of practice. Even designing a cartridge is not a big deal if you just want an average product. It's a damn repetition and I wasted a lot of time in that pattern too. "I don't ship out my cartridges right after their construction. I always listen to them for a couple of hours, make any necessary adjustments and then let them sit for about a week. I then repeat the same process until at least 20 hours of listening sessions have accumulated. So it usually takes 2 - 3 months from the construction of a Miyabi cartridge to its delivery. This is a bit different from what people call break-in. 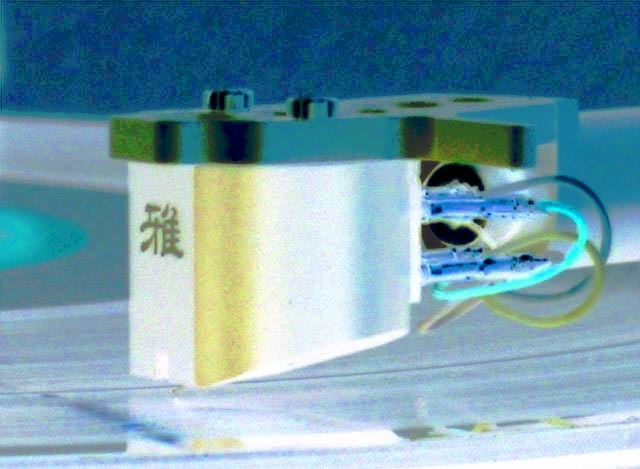 A Miyabi cartridge is like a living thing made of a combination of different materials. It needs to be well taken care of to reach its stable stage in the same way that a baby needs care and a child needs an education to grow up to become a decent adult." 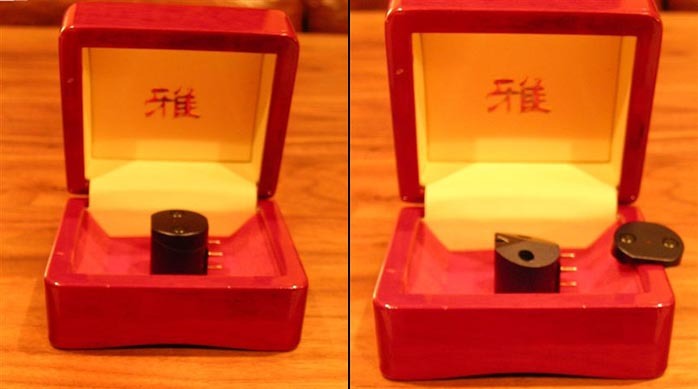 I was pretty much awed by the stylish appearance of the Miyabi Standard moving coil cartridge in its jewelry-like polished wooden case - a fitting container given the amount of artistry that goes into making each and every Miyabi cartridge. The Standard's body is crafted from aluminum and its rounded shape is a styling cue taken from the first cartridge design Mark Levinson ordered for his Cello product line. The Standard also has a very unique stylus guard that puzzled the heck out of me for a few seconds before I figured out how to get it off to gain access to the screws beneath that hold the cartridge securely in its case. The Miyabi Standard is the first cartridge Takeda San designed without OEM cost restraints. It was crafted to overcome important performance gaps that he felt had been left in modern cartridge designs. Takeda San says, "I was always frustrated by modern cartridges -- including my own designs in the past -- because they always sounded clean and nice but failed to present a very important element of music. What was missing was the linearity of dynamics. Many cartridges can produce clean sound but the sound is only one element of music. They fail to present the flow of music. Listeners may not realize this if they are not familiar with music that requires a wide dynamic range and delicate gradations within it. Large orchestral works and certain piano recordings are typical examples. I also wanted my Standard to be tonally as neutral as possible. Many cartridges have some degree of coloration to make them sound appealing. I didn't want to do that with the Standard." The cartridge uses Alnico magnets because Takeda San likes the sound of Alnico: 'It is firm yet not nervous. The other materials in the cartridge are chosen to achieve certain results in combination with each other." The Miyabi Standard cartridge has an output voltage of 0.2 mV and a frequency response of 20Hz - 40kHz (± 2dB). The channel separation is greater than 25dB and the internal impedance is 2 ohms. The Standard is a low compliance cartridge at 9 x 10 (-6)cm/dyne and has a recommend tracking force of 2 grams. The stylus is a line contact design and the cantilever is a special aluminum alloy (read Takeda's secret). As mentioned above, the magnet material is Alnico and the coils are copper. The weight of the cartridge is a whopping 13.5 grams. When I asked Takeda San what kind of listener he designed the Miyabi Standard for, his answer surprised me: "Well, I actually designed it to appeal to myself, to the way I want to listen to music." You can't argue with the logic of designing a cartridge that you enjoy listening to yourself. Chances are that if someone with as distinguished tastes as Takeda San likes it, you and me might just like it, too. The history and background of Takeda San and his labors to handcraft each and every Miyabi cartridge to be a musical work of art sure get me excited. I have a real treat in store for you (and me too! 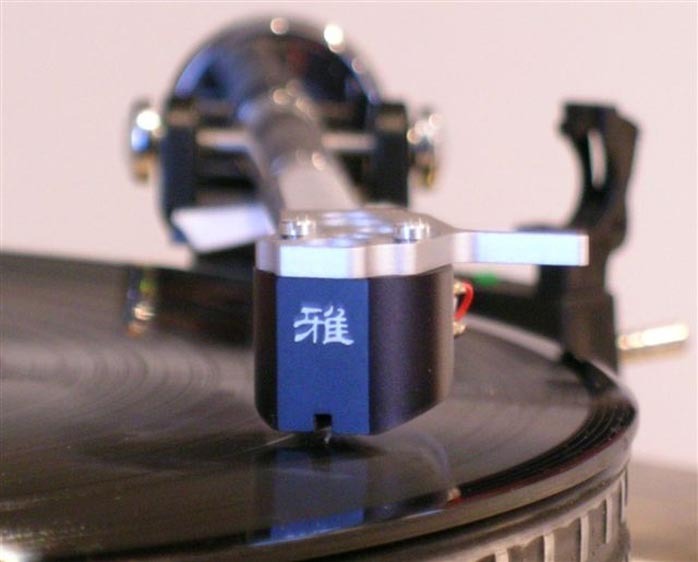 ): This preview of the Miyabi Standard is the kick-off for the first review of a series of reviews that will survey the Miyabi Standard, the Miyabi 47 and the Miyabi Custom moving coil phonograph cartridges. I have the Miyabi Standard and Miyabi 47 here now and the Miyabi Custom will be coming along in time. Takeda San gave me some good advice and encouraged me to be patient: "Cartridges need some time to settle and stabilize their performance so I do not send the finished cartridge out right after it's constructed. I repeat the listening and adjusting session until I'm sure its performance is stabilized. I do it by myself with each and every cartridge that leaves my studio with the Miyabi tag on it. So the production is very limited and sometimes you may have to wait a while until its delivery but please be patient with me. I don't think you'll be disappointed when it arrives at your door."